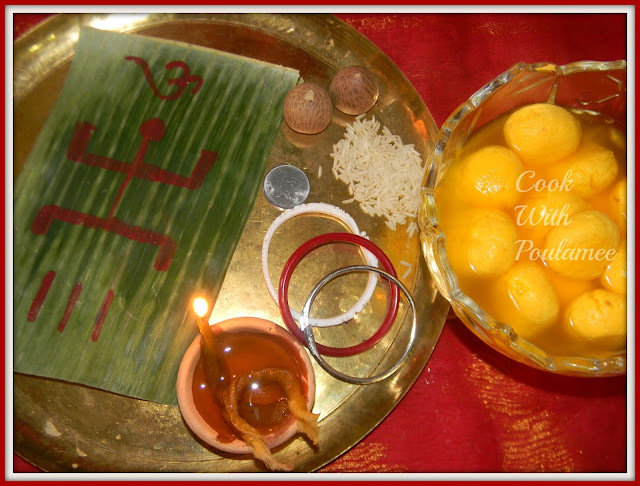 One of the important festivals of West Bengal is Poila Baisakh the Bengali New Year. This is a very special day for all of us, I remember in my childhood days I usually used to go with my grandmother to take bath in the holy river GANGA. And after that we all used to wear a new dress, used to go temple for puja specially to wish that the year must go smoothly. The best part of the festival is food which is almost a best part of the day. My maa always loves to prepare so many dishes on the special day. And among everything she used to prepare sweets, because without sweet dish the menu will never be completed. I know I am sitting far away from home but how can I stop myself to prepare something special on the special day. 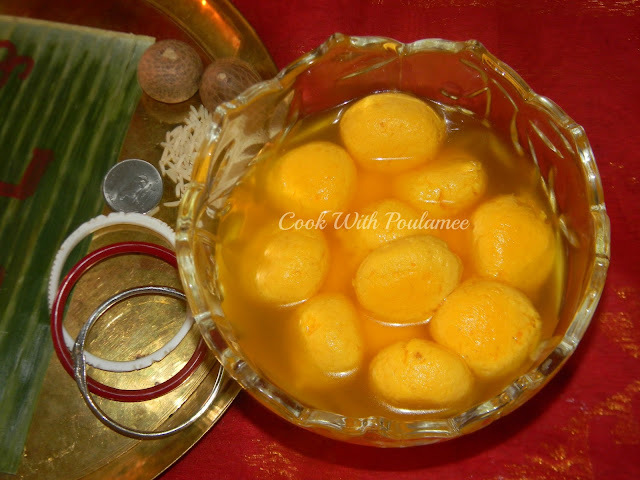 Apart from the platter I prepared some KOMOLA BHOG or ORANGE FLAVOUR CHEESE BALL an authentic sweet of Bengal. The basic ingredients are milk and oranges. 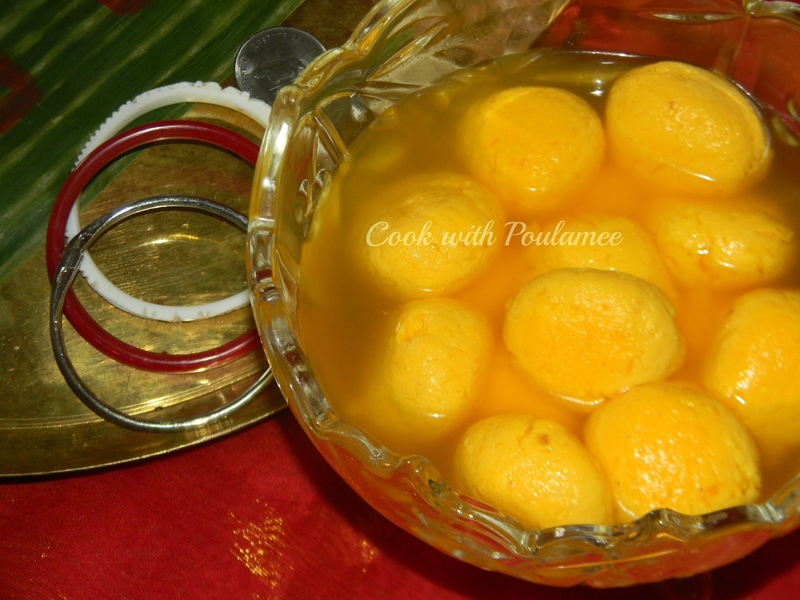 The flavor of orange makes the sweets a nice aromatic. Hope this New Year brings lots of happiness to your life subha POILA BAISAKH. 2.One big cup of of fresh orange juice. 3.One tea spoon of suji or semolina. 5.Few drop orange food color. Put the milk in a heavy bottomed vessel and let it become boil, then add the orange juice at a time and keep on stirring until milk starts to curdle and the water separates. Now put everything in a cheese cloth and Wash the chena under running cold water. Now hang the chana for 4 to 5 hr. Now add the suji in the chana and smash the chena with your palm till it very smooth. Now add 2 to 3 drop of orange food color and mix well. Now make some small round shape baal with the chena. In a big wide pan add half cup sugar and 1 cup water, when the water start boiling add some orange zest, and slowly add the orange chena balls and cook in medium heat with a lid for 15 to 20 mints. Your Komolabhgo is ready serve hot or cold.